Many advertisements in the media are promoting the use of vitamin D and are encouraging you to determine if you are deficient for Vitamin D. “Sign of low vitamin D. Do you take vitamin D supplement? 7 Surprising benefits of vitamin D” and the list goes on… While an accumulation of scientific evidences describe the effects of vitamin D in cancer prevention, its potential role in endometriosis development is only recently emerging and display some conflicting results. In this blog, we will give you a clear insight of what is known about Endometriosis in relation to Vitamin D and how it can help managing your condition. Endometriosis is an inflammatory condition, driven by the hormone estrogen and may cause chronic pelvic pain, alteration of the menstrual cycle and sub/infertility. It is important to highlight that many patients with endometriosis don’t present any symptoms (Silent endometriosis). For more information, please consult the link below: (http://www.preventmiscarriage.com/Literature-Review-Blog/2015/May/Silent-Endometriosis-diagnosis-based-on-immune-f.aspx). Genetic: women with a close relative affected by endometriosis have a higher risk of developing the disease. Immunologic factors: many pro-inflammatory cytokines such as IFN-γ, IL-18 and IL-17 have been linked to the risk of developing endometriosis. Further, the prevalence of endometriosis is higher in patients affected by autoimmune diseases (inflammatory conditions). Vitamin D is a fat-soluble vitamin belonging to the steroid hormone family. Vitamin D3 (cholecalciferol) that you synthetize after sun exposure and represent 95% of your vitamin D production (2). 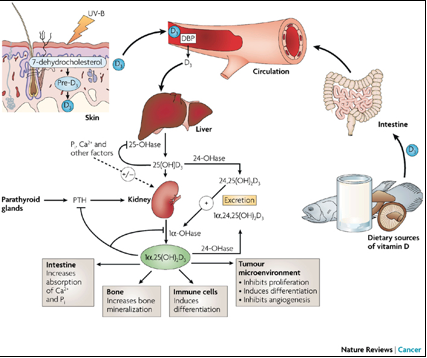 Figure 1: Vitamin D metabolic pathway. Vitamin D and its receptor are present in the ovaries (3) where they stimulate the production of the steroid hormones estrogen and progesterone (4). The endometrium (uterus) itself can synthesize the active form of Vitamin D (5) and express the vitamin D receptor VDR as well (3). A study led in women with endometriosis (proven by laparoscopy) showed that ENDO patients (n=87) have higher levels of the non-active form of vitamin D (calcidiol) when compared to controls women (disease-free patients, n=53). The non-active form of vitamin D is the best indicator of vitamin D status because of its easy measurement and long half-life in circulation (~2–3 weeks) (6). The difference seen between the two groups (ENDO vs. disease free patients) although significant (p=.05) was very small with a concentration of 24.9 ng/mL for ENDO patients versus 20.4 ng/mL for controls (7). This difference is not seen when considering the active form of vitamin D (calcitriol). A vitamin D deficiency has been defined as calcidiol levels between 20 and 37 ng/ml (8). In the present study, the cut-off value (28.2 ng/ml) defining high vitamin D levels falls within this range which means that even some ENDO patients characterized by high vitamin D levels in the study have in fact low vitamin D levels when considering this standard range. Further, the number of patients is limited, altogether these data should be taken with caution to conclude any association of endometriosis with high Vitamin D levels. Another study including women with ENDO (n=46) and healthy control patients (n=33) (9) showed no difference in Vitamin D levels between the two groups (25.7 ng/ml in ENDO patients vs 22.6 ng/ml in the disease free women). The number of patients was limited in both groups. More recently, a study comparing n=1385 cases of ENDO proven by laparoscopy to over 69 000 disease-free women (The Nurse Health Study) showed that women in the highest quintile for vitamin D have 24% lower risk of endometriosis than those in the lower quintile (10). These results, without proving any causality between vitamin D levels and endometriosis, showed a strong association between low levels of Vitamin D and the occurrence of endometriosis. Higher expression of VDR levels in the endometrium were found in ENDO patients as compared to disease-free patients (9, 11). Interestingly, a genetic study showed that specific forms of the genes coding for VDR (genetic variant) are strongly associated with endometriosis. Indeed, the AT haplotype for VDR Bsml rs 1544410 and Fok1 rs 2228570 minor alleles showed strong association with endometriosis and may constitute a genetic risk factor (12). Further, Fok1 give rise to two forms of VDR, the long form encoded by the minor allele is almost twice less efficient than the shorter form (13) which could mean that patients carrying this allele have lower VDR activity despite having normal VDR expression. Although encouraging, these results should be taken with caution and the same kind of studies should be run on larger groups of women of multiple ethnicities. For now, and until the completion of larger studies including women of multiple ethnicities, it is not possible to affirm that the presence of these alleles are markers of a defective VDR and could cause endometriosis. Although, there is currently no test available to ascertain VDR activity, it may be possible to indirectly evaluate it by measuring, on endometrial biopsy, the expression levels of specific vitamin D target genes such as HOXA10 (whose function is described below). If Vitamin D levels within normal range failed to induce the expression of specific genes in the uterus, it may be due to a lack of VDR activity or a defective signal transduction. In which case, supplementing further with Vitamin D would be useless. Inflammation, Immune response, angiogenesis and apoptosis (cell death) are altered in favor of the survival and growth of the endometriotic tissue and are likely to enhance their adhesions outside the uterus (14). Many studies showed that Vitamin D by regulating these parameters could play a beneficial role in limiting endometriosis development. a molecule involved in the adhesion process, MMP-9 (matrix metalloproteinase 9). Jointly, the inhibitor of MMP-9, namely TIMP-2 is significantly increased by Vitamin D treatment which limits the adhesion of endometrial tissue in the peritoneal cavity (19). In a mice model for endometriosis (20), vitamin D administration during the induction of endometriosis represses lesions development by 42%. If the administration is given before and maintained after the endometriosis induction, there is a 73% reduction in lesion development showing the preventing action of vitamin D. Vitamin D, even given post endometriosis induction, can limit the disease progression, with 39% reduction in the development of lesions, highlighting its therapeutic efficacy to treat already established lesions. Similarly, to the study in rat (19), vitamin D was here shown to repress the adhesions of endometrial cells in the peritoneal cavity. Further it prevents the recruitment of macrophages thus leading to a reduction of peritoneal inflammation. Reduction of apoptosis (cell death) in unaffected tissue of women with endometriosis has been associated with susceptibility to develop lesions (21). Among the regulators of apoptosis, survivin (an anti-apoptotic factor) is increased in endometriotic lesions while it is normally suppressed by Vitamin D (22). In ENDO patients, low levels of Vitamin D could prevent or at least minimize survivin inhibition which could help endometriotic lesions from escaping apoptosis. At Braverman Reproductive Immunology, we are constantly working in studying the latest discoveries in the field of reproductive immunology and promoting their use to offer you better diagnostic, monitoring and treatments. We are systematically determining your Vitamin D levels and if appropriate, we recommend supplementation to replenish your vitamin D reserve and optimize your chances of having a healthy pregnancy. 1-	S.A. Missmer, D.W. Cramer, The epidemiology of endometriosis, Obstet. Gynecol. Clin. N. Am. 30 (2003). 2-	Holick MF. Vitamin D deficiency. N Engl J Med. 2007 Jul 19;357(3):266-81. Review. 3-	Agic A, Xu H, Altgassen C, Noack F, Wolfler MM, Diedrich K, Friedrich M, Taylor RN & Hornung D. Relative expression of 1,25-dihydroxyvitamin D3 receptor, vitamin D 1a-hydroxylase, vitamin D 24-hydroxylase, and vitamin D 25-hydroxylase in endometriosis and gynecologic cancers. Reproductive Sciences 2007 14 486–497. 4-	Parikh G, Varadinova M, Suwandhi P, Araki T, Rosenwaks Z, Poretsky L & Seto-Young D. Vitamin D regulates steroidogenesis and insulin-like growth factor binding protein-1 (IGFBP-1) production in human ovarian cells. Hormone and Metabolic Research 2010 42 754–757. 5-	Vigano` P, Lattuada D, Mangioni S, Ermellino L, Vignali M, Caporizzo E, Panina-Bordignon P, Besozzi M & Di Blasio AM. Cycling and early pregnant endometrium as a site of regulated expression of the vitamin D system. Journal of Molecular Endocrinology 2006 36 415–424. 6-	Vieth R. Vitamin D supplementation, 25-hydroxyvitamin D concentrations, and safety. Am J Clin Nutr. 1999 May;69(5):842-56. Review. 7-	Somigliana E, Panina-Bordignon P, Murone S, Di Lucia P, Vercellini P, Vigano P. Vitamin D reserve is higher in women with endometriosis. Hum Reprod. 2007 Aug;22(8):2273-8. 8. Bandeira F, Griz L, Dreyer P, Eufrazino C, Bandeira C, Freese E. Vitamin D deficiency: a global perspective. Arq Bras Endocrinol Metab 2006; 50:640–646. 9. Agic A, Xu H, Altgassen C, Noack F, Wolfler MM, Diedrich K, Friedrich M,Taylor RN, Hornung D. Relative expression of 1,25-dihydroxyvitamin D3 receptor, vitamin D 1 alpha-hydroxylase, vitamin D 24-hydroxylase, and vitamin D 25-hydroxylase in endometriosis and gynecologic cancers. Reprod Sci. 2007 Jul;14(5):486-97. 10. Harris HR, Chavarro JE, Malspeis S, Willett WC, Missmer SA. Dairy-food, calcium, magnesium, and vitamin D intake and endometriosis: a prospective cohort study. Am J Epidemiol. 2013 Mar 1;177(5):420-30. 11. Zelenko Z, Aghajanova L, Irwin JC and Giudice LC: Nuclear receptor, coregulator signaling and chromatin remodeling pathways suggest involvement of the epigenome in the steroid hormone response of endometrium and abnormalities in endometriosis. Reprod Sci 19: 152‑162, 2012. 12. Szczepańska M, Mostowska A, Wirstlein P, Skrzypczak J, Misztal M, Jagodziński PP. Polymorphic variants in vitamin D signaling pathway genes and the risk of endometriosis-associated infertility. Mol Med Rep. 2015 Nov;12(5):7109-15. 13. Arai H, Miyamoto K, Taketani Y, Yamamoto H, Iemori Y, Morita K, Tonai T, Nishisho T, Mori S and Takeda E: A vitamin D receptor gene polymorphism in the translation initiation codon: Effect on protein activity and relation to bone mineral density in Japan women. J Bone Miner Res 12: 915‑921, 1997. 14. Bulun SE. Endometriosis. N Engl J Med. 2009 Jan 15;360(3):268-79. 15. Adorini L, Amuchastegui S, Daniel KC. Prevention of chronic allograft rejection by Vitamin D receptor agonists. Immunol Lett. 2005 Aug 15;100(1):34-41. Review. 16. Cippitelli M, Santoni A. Vitamin D3: a transcriptional modulator of the interferon-gamma gene. Eur J Immunol. 1998 Oct;28(10):3017-30. 17. Helming L, Böse J, Ehrchen J, Schiebe S, Frahm T, Geffers R, Probst-Kepper M, Balling R, Lengeling A. 1alpha,25-Dihydroxyvitamin D3 is a potent suppressor of interferon gamma-mediated macrophage activation. Blood. 2005 Dec 15;106(13):4351-8. 18. Giarratana N, Penna G, Amuchastegui S, Mariani R, Daniel KC, Adorini L. A vitamin D analog down-regulates proinflammatory chemokine production by pancreatic islets inhibiting T cell recruitment and type 1 diabetes development. J Immunol. 2004 Aug 15;173(4):2280-7. 19. Yildirim B, Guler T, Akbulut M, Oztekin O, Sariiz G. 1-alpha,25-dihydroxyvitamin D3 regresses endometriotic implants in rats by inhibiting neovascularization and altering regulation of matrix metalloproteinase. Postgrad Med. 2014 Jan;126(1):104-10. 20. Mariani M, Viganò P, Gentilini D, Camisa B, Caporizzo E, Di Lucia P, Monno A, Candiani M, Somigliana E, Panina-Bordignon P. The selective vitamin D receptor agonist, elocalcitol, reduces endometriosis development in a mouse model by inhibiting peritoneal inflammation. Hum Reprod. 2012 Jul;27(7):2010-9. 21. Fujino K, Ueda M, Takehara M, et al. Transcriptional expression of survivin and its splice variants in endometriosis. Mol Hum Reprod 2006;12:383–8. 22. Londero AP, Calcagno A, Grassi T, Marzinotto S, Orsaria M, Beltrami CA, Marchesoni D, Mariuzzi L. Survivin, MMP-2, MT1-MMP, and TIMP-2: their impact on survival, implantation, and proliferation of endometriotic tissues. Virchows Arch. 2012 Nov;461(5):589-99. 23. Li F, Ling X, Huang H, et al. Differential regulation of survivin expression and apoptosis by vitamin D3 compounds in two isogenic MCF-7 breast cancer cell sublines. Oncogene 2005;24:1385–95. 1,25-(OH)2D3 in human myelomonocytic cells and human endometrial stromal cells. Mol Endocrinol. 2005 Sep;19(9):2222-33.